The nice thing about rock bottom is this - once you hit it, there's nowhere to go but up. The problem is, you may think you hit rock bottom, but realize you still have a ways to go. I am now, no contest, the fattest I have ever been. I could blame it on travel, or Dad's illness, or Lola's demise... but what it really comes down to is that I have been trying to solve life's problems with the almighty calorie. Every single bad feeling I have, my inner voice says things like "Kill it! Kill it with gravy!" I am trying to bury all the crap in my life under a pile of carbs and fat. So, I kind of had a meltdown/breakthrough about it earlier today, and I realized that hopefully *this* is, in fact, rock bottom, and I cannot go any further down the rabbit hole or up the scale than this. Of course, I realized that on a full stomach. As one will. The fact that I'm coming off a stressful weekend - a quick trip to Atlanta to see Dad in his new (hopefully super-temporary) rehab facility - doesn't help. Lots of driving, lots of eating for speed and comfort. The fact that tomorrow, I head to Texas and Wisconsin for the week doesn't help. Lots of eating out in places known for their deep fried, their cheese, their beer. But. I want to be healthy. I'm tired of feeling bad, of not liking the way I look. I know I can do it, I know I deserve better. I just need to start. PS - I believe that "Kill it! Kill it with gravy!" might be an excellent tattoo. 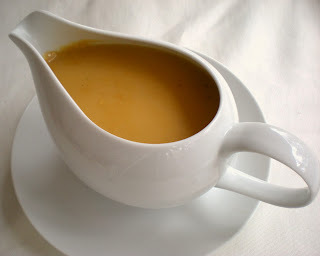 With a gravy boat... if I were into that sort of thing. PPS - I will confess to having indulged in something of a "Last Supper" tonight. But I won't confess what it was. PPPS - A Shiny Pearl to that nice trooper from the Georgia State Patrol today - and he knows why.